"Something is off. We don't know what it is. We gotta figure it out and get him home." Just days before Christmas, a Long Island family is desperately trying to get the body of their veteran husband and father back home from China after he mysteriously died on a flight there from New York. NBC 4's Stacey Bell with the story. China won't return his body unless the family signs a waiver; Easy's family says "something is off"
Just days before Christmas, a Long Island family is desperately trying to get the body of their veteran husband and father back home from China after he mysteriously died on a flight there from New York. On Friday, Dec. 7, retired Lt. Col. Norman Easy, a health care executive, boarded a China Eastern Airlines flight at JFK Airport and headed to Shanghai for a business trip. He travels frequently, according to his family, but wife Nixtia panicked when the father of four didn't let her know he'd landed in China. "He always communicates with us, and I didn't hear nothing from him," said Nixtia. When he didn't show up for a meeting on Monday, his company dispatched a team to find him. 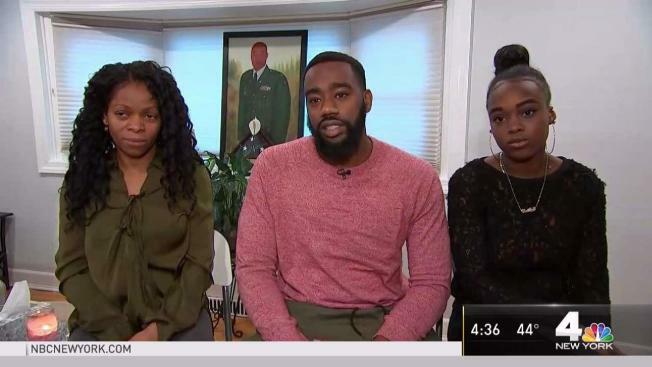 "One of the police officers who happened to be at the airport when he died [also] happened to be at the police station when the team got there," his son Marcus told News 4 New York. What the officer told the team was devastating. "He said that someone matching my dad's description passed away on the plane," Marcus said. "They weren't allowed to verify that it was him but they're 100 percent sure it was him." Since then, the Easy family say they've been getting the runaround from the Chinese government. They can't find out how he died, and they can't get his body. "Just a good man who's done so much for his family -- not just for his family, but for the country and gave up almost 30 years of his life," said daughter Caitlin. "I just feel like the treament he's been receiving is so heartbreaking." Family members said they were told on Wednesday that Easy's wife had to sign a waiver saying she doesn't object to anything in the police report -- a report she said she hasn't even seen -- before China will return his body. "The fact that they're not willing to give us his body or death certificate or even the police report until we sign this waiver is just ridiculous," said Caitlin. Easy's birthday is Christmas Eve. The family can't start to grieve until they have his body home, but they were determined to find out. "Something is off. We don't know what it is," said Marcus. "We gotta figure it out and get him home."